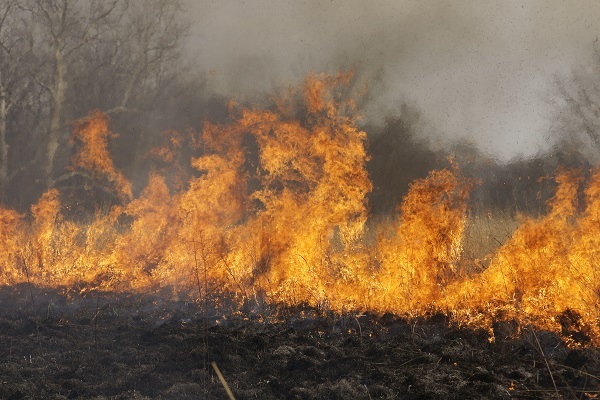 Drought and fires this year recall memories of prairie fires in homesteading days. In high winds, fires moved rapidly, burning grass, crops, livestock, wildlife, buildings, and people. One time a homesteading father saw a fire fanned by winds toward his farm. He realized he and his family could not run away from it. He sent his son to the house for a box of matches and gathered his family together. He struck a match and set a fire. In the wind, the fire rose rapidly and began to burn across the farm. After only a few minutes, he led his family onto burnt out ground. Minutes later, when the prairie fire reached the farm, the flames came to the burnt out ground and found no fuel there to burn. The prairie fire skipped around the burnt out ground, and the family standing on it was saved. The cross of Christ is the burnt out ground. It is the ground of safety from the judgment of God upon sin. When the fire of judgment reaches the cross, there the wrath of God on sin already has been exhausted on Christ, who suffered judgment in our place. The consuming fire of judgment is itself consumed by the holiness and magnificence of the person of Christ. The idea of God’s wrath on sin is out of fashion. In many places, the impression people have of Jesus is a nice, marshmallow of a swell fella who surely did away with any need to think about sin or judgment. Actually, it was Jesus who revealed hell. We can’t learn much about hell in the Old Testament. There is some talk about a place called Sheol. It is a shadowy place. The description is sketchy. We don’t learn much about it. We can’t learn much about hell in the New Testament except in the words of Jesus himself. Jesus is the revealer of hell. He uses a word that pictures eternal fire. The word is geenna. This is the name of a valley on the south side of Jerusalem. It was the town dump. The garbage and dead animals were thrown there. It burned and burned constantly. Jesus chose this word to reveal hell. This is the word we see translated as “hell” in our English Bibles when Jesus speaks. Sometimes when people find out it was Jesus who revealed hell like this, they are tempted to stop liking him. It can’t hurt to remember, though, that at the same time He revealed hell fire, He came to save us from it, by suffering in our place. What is Jesus doing in retirement?